LEDs have been creeping into more and more everyday applications since they were discovered in the 1960s, but until now their placement and usage has been somewhat limited. Researchers at the University of Illinois think that they’ve figured out a way to make stretchable, flexible LEDs that will make it possible to use them in never-before-seen types of displays and configurations. In general, organic LEDs (used for applications like cell phone screens) are smaller, cheaper and easier to produce, but inorganic LEDs (like you might see on an outdoor electronic billboard) are brighter and more durable. 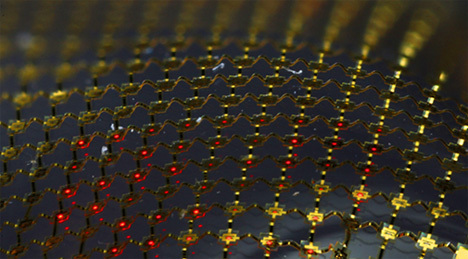 This new technology combines the best attributes of both types of LEDs and makes it possible to use them in thin, flexible arrays that were impossible with inorganic LEDs until now. The new LEDs are manufactured by depositing light-emitting material onto a wafer layer, with a “sacrificial layer” between them. The sacrificial layer is dissolved away (leaving the wafer free to be used again, unlike traditional LED manufacturing methods) and the LEDs can then be mounted to just about any substrate. 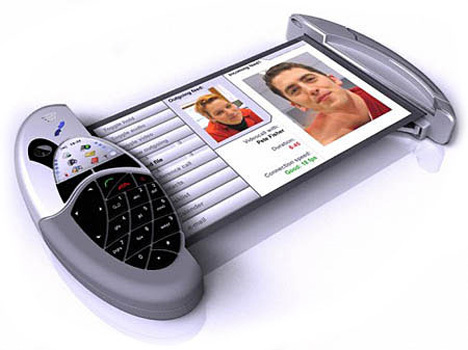 The applications are varied and exciting. The research was partially funded by Ford, who want to include a red flexible LED brake light on future vehicles. 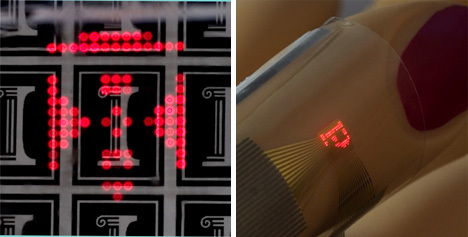 The flexible LEDs could also be used for roll-up computer/television screens, or health monitors worn directly on the skin. See more in Computers or under Gadgets. September, 2009.